A couple of weeks ago, I helped our high school music boosters club raise money for kids in band and choir. I thought you might appreciate seeing a photo of our stand. All we sell is two kinds of beer and one kind of peanuts; it's nothing complicated. However, that kind of simplicity should not be underestimated; in approximately three hours, we sold $8500 worth of beer and peanuts that day. 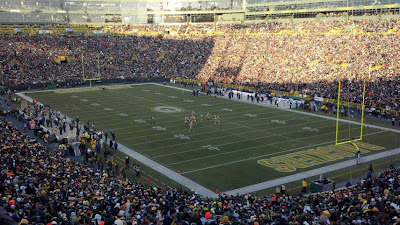 Maybe it was the Packers' crushing victory over the Oakland Raiders (46 to 16), but people were quite cheerful that evening, and, for what it's worth, we sold out of Miller Genuine Draft. Yes, I was a little cold, but not because I can't handle 38 degrees Fahrenheit; it was the 15-20 mph winds from the southwest that that made things a bit uncomfortable. My eyes always, always tear up in winter wind, so that was kind of annoying. 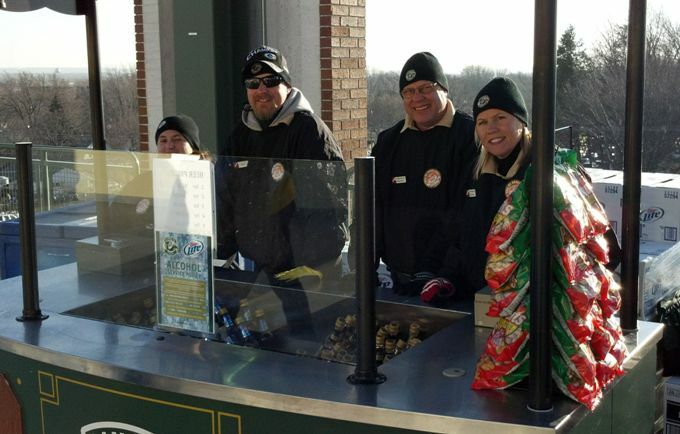 Did I mention that our stand is on the southwest side of the stadium? It was actually kind of fun, though, and every now and then, I got to steal away into the stadium and take a peek. I'm signed up again for the New Year's Day game. I don't know what I was thinking when I did that. After all, we're talking the Frozen Tundra here, home of the infamous Ice Bowl in 1967. It was "the coldest game in league history," with temps at -15 and winds gusting at 18 mph. You'll never guess what date that was (unless you know football history, of course)...It was December 31st, 1967. Thank goodness, my friend Dawn has agreed to throw caution to the wind that day, as well. (Thanks, Dawn!) We think it might actually be fun; you know, like a story we can tell our grandkids some day, just like those who were in attendance at the great Ice Bowl. Just think! We might be able to say, "We were there when...."
...assuming we don't freeze to death.